I’m in process of developing a new walking tour of Shanghai. After many years of covering the French Concession and the Bund, I’m moving onto new territory, namely the area around the People’s Square/Park, formerly the Recreation Ground of the International Settlement. The theater district, which I mapped out for my dissertation. This map is published in my book Shanghai's Dancing World. t stands for theater, d for dance hall, c for cinema, h for hotel. G is for Great World, N is for New World, and the big department stores on Nanjing Road are S (Sun Co.), Si (Sincere's) and Su (Sun Sun). In this map, Tibet Road or Xizang Road is just to the right of the Recreation Ground and Nanjing Road runs above it. While researching my doctoral dissertation on the city’s nightlife of the 1920s-30s, I used commercial maps made in the 1940s to locate all of the leisure and entertainment spaces in the city. I discovered in the process that the area around the Recreation Ground was a hotel and theater district. Many of the city’s earliest jazz cabarets, ballrooms and nightclubs rose up around the perimeter of the Recreation Ground. I’ve always thought that a tour of the perimeter would provide an interesting set of stories. So this morning I walked over to Tibet Road (now Xizang Road 西藏路) and looked around. Here are some preliminary ideas for a walking tour of that area. The tour begins at the Shanghai Concert Hall, which was originally known as the Nanking Theater. This hall was physically moved to accommodate the Yan'an elevated road 延安高架. It now holds concerts by international performers featuring a wide range of musical performances. 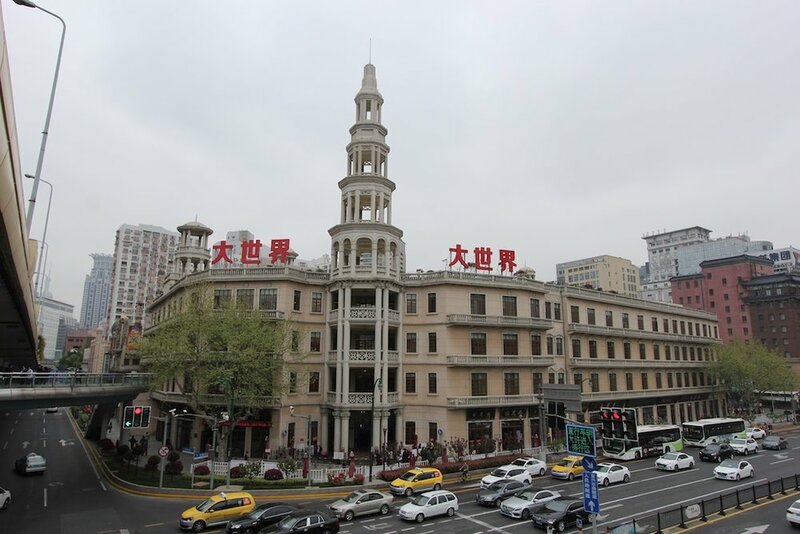 The next stop on the tour is the Metropolo Hotel, formerly the YMCA Building, located on Xizang Road just south of the Great World. The plaque on the door features some information about the social and cultural importance of this building in the old days. After that, we pass by the Great World 大世界， a former theater and amusement center and one of the great icons of Old Shanghai. In the 1930s, this amusement center was notorious for its gambling halls, dance halls, and other fun stuff. After being shut down for several years, the building was recently renovated and reopened. I decided to take a look and see what’s inside. The 60 RMB entrance ticket was a stunner—is it really worth the entrance price? What I found wasn’t very thrilling. The funhouse mirrors are still there. The open theater is showing a film giving a history of the Great World. The halls on the four floors of the building are dedicated to different activities. The second floor focuses on food, and you can get a nice variety of Shanghai style delicacies in the cafeteria. The third and fourth floor were featuring special displays of Chinese folk crafts from different parts of China, and there was also a special exhibit on the Silk Road. All were geared for children. I’d say it’s worth the entrance but only if you are interested in folk crafts and can speak Chinese, then you can spend some quality time talking to the folks who run the various stations, who are accomplished artists and craftspeople. The high entrance fee serves to limit the number of people in the Great World, so it does serve a purpose, although the line into the VR display of Old Shanghai was too long and took too much time for me to try it out. Walking north on Xizang Road, one then passes by a string of old hotels. These include the Far Eastern Hotel 远东饭店, which once housed one of Shanghai’s earliest Chinese dance halls starting in 1928. I checked in the lobby to see if this is still operating as a hotel, but the man at the desk told me that around five years ago it was converted into an office building. Just north of that building, wedged in between Beihai and Guangdong Roads 北海路广东路, is the Shanghai Workers Culture Palace 上海工人文化宫 which was established in 1950, though the building dates to 1929. I entered the building and went up two floors to see the exhibition on the history of the Communist Party which is currently there. It was a rather simple affair with mainly wall size images and lots of old photos, paintings and illustrations relating the history of the CCP and its rather complicated relationship to Shanghai. Naturally the exhibit ends around 1949. One of the highlights was a room with walls and columns covered with colored notes handwritten by thousands of visitors, praising the glories of the CCP. Unfortunately, some of the most interesting old hotels from the 1920s-30s were knocked down in the late 1990s to make way for the Raffles City shopping mall. This is a real shame, since the Yipinxiang 一品香 or Y.P.S. Hotel and the Chai Loh Hotel were on that spot. I must have visited them in the 1990s when I first came here to research my dissertation on Old Shanghai nightlife, but back then I had no idea of the magnitude of the wave of destruction and loss to the city’s built environment that was coming, or else I would have taken a lot more photos than I did. Next time you go to Raffles City, just remember that once on that block stood a hotel where Chinese first learned how to eat western meals with a knife and fork, and where they once held lavish parties with courtesans, some of whom were likely from the nearby alleyway of Huileli. Katya Knyazeva, who runs a wonderful blog of her own, one of the best blogs about excavating Shanghai’s past that I know of, has done some good sleuthing and uncovered an old photo and an ad for the hotel. She identifies the C. L. Dance Hall in this photo correctly as the dance hall belonging to the Juelu Hotel 绝绿饭店, which was next door to the Y.P.S. However, the English name of the hotel and dance hall was Chai Loh, as seen in this name card from the 1930s which a U.S. Fourth Marine put into his scrapbook. The Chai Loh or Chai Lob as it was sometimes known was very popular among the US military men stationed in Shanghai in that era. This was also one of the earliest Chinese dance halls to open in 1928, along with the Peach Blossom Paradise opened inside the Y.P.S. Hotel. Chapter 2 of my book Shanghai’s Dancing World covers the history of these earliest dance halls in some detail.